The Choose One action allows you to prompt the user to make a single choice given one or more options. The choices are presented as Radio Buttons. For more information on variables, including creating your own project and user variables, see here. Note: By default, interactive actions are not available from the FinalBuilder console. Interactive actions cannot be used inside Async Action Groups. Add one or more choices with their corresponding value. The variable will be set to the value of the chosen choice. 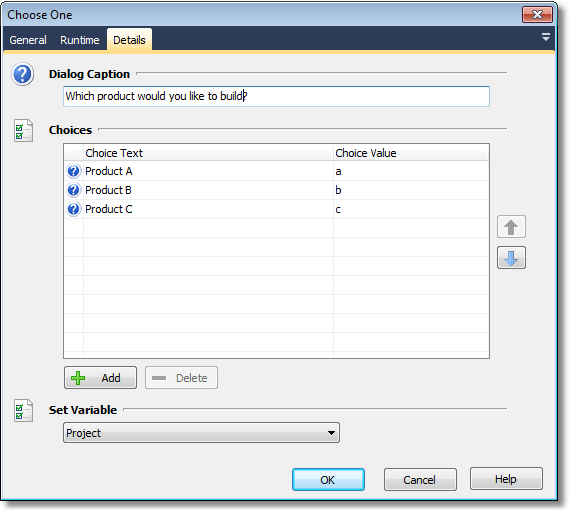 Select the variable to set to the chosen choice value. The first option is always chosen as default. Pressing OK will set the variable, whereas Cancel will fail the action.